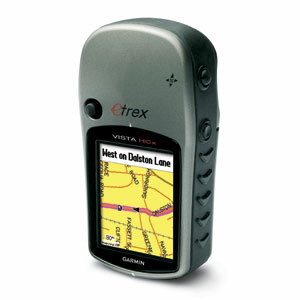 With its high-sensitivity, WAAS-enabled GPS receiver, eTrex Vista HCx locates your position quickly and precisely and maintains its GPS location even in heavy cover and deep canyons. The advantage is clear — whether you’re in deep woods or just near tall buildings and trees, you can count on Vista HCx to help you find your way when you need it the most. The Vista HCx has a built-in electronic compass that provides bearing information even while you're standing still, and its barometric altimeter tracks changes in pressure to pinpoint your precise altitude. You even can use the altimeter to plot barometric pressure over time, which can help you keep an eye on changing weather conditions. 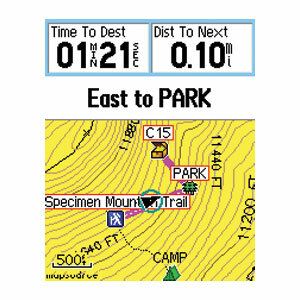 Adding maps is easier than ever with Vista HCx's microSD card slot. Conveniently plug in optional preloaded microSD cards with MapSource® data for your land and sea excursions. 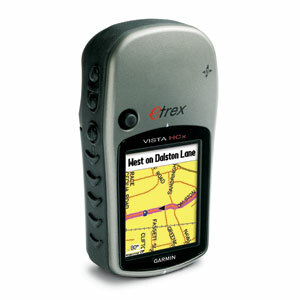 Just insert a MapSource card with detailed street maps, and Vista HCx provides turn-by-turn directions to your destination. The card slot is located inside the water resistant battery compartment, so you don't have to worry about getting it wet. 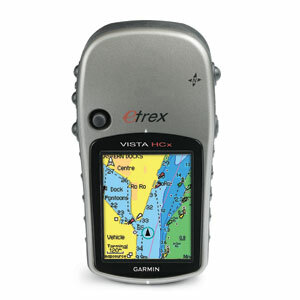 Like the rest of the eTrex series, Vista HCx is lightweight and compact — the perfect size for all your travels. Water resistant, so it can withstand the elements or an accidental dunk in water.